What a Guy! 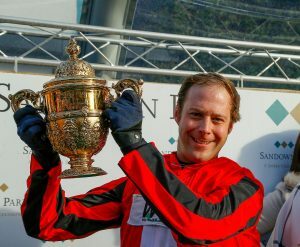 Disney repeats Royal Artillery Gold Cup victory! 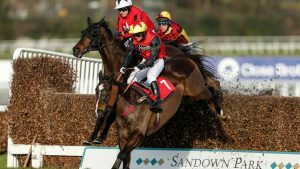 Captain Guy Disney enjoyed another fairytale at Sandown yesterday when partnering last year’s victorious Rathlin Rose in the Royal Artillery Gold Cup to repeat an emotional victory. Producing his horse with perfect timing, Guy patiently waited until the last before urging the 10-year-old up the hill to win comfortably. 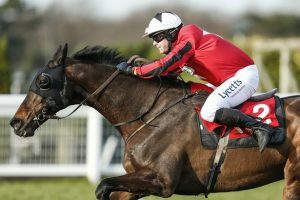 Following his win, Guy said “I think when you’re on a horse like this who jumps, travels and has been round the course and distance, it’s lovely. 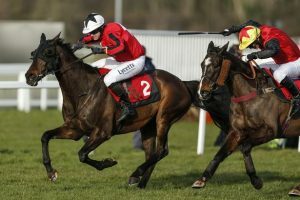 Look at his run in the Welsh National – he’s very good. It’s very nice to ride a horse like that. I saw Roddi Greene in the week – I’ve had a few bad falls this year – and I was just trying to calm things down a little bit. There’s more time than you think and you don’t have to rush. “You can’t bottle the feeling of winning this race – I didn’t want to rest on my laurels from last year – and I’m chuffed for David [Pipe] and Fergus Wilson. Huge congratulations to Guy on making history by recording the first back-to-back win of this wonderful race.